I was astonished to hear today that somebody had called Mike from Vox Political a ‘misogynist’ because he had called someone ‘mouthy’. Mike’s accuser was under the impression that ‘mouthy’ was a term that was only used against women. Now I’m aware that a staple of misogynistic abuse and jokes down the centuries have been about women’s supposed greater predisposition to talk and gossip. There’s even been some scientific evidence presented for this. Supposedly, women on average talk so many more thousand words per day more than men. On the other, it’s also been claimed that male and female brains are biologically different, and this explains why women are better at language skills, while men have better spatial skills. This has also been challenged by neuroscientists, who’ve said that, except for people at the extreme ends of the scale of gender characteristics, there’s no difference between the brains of men and women. So that fact – that women talk more than men – may be another factoid. But the term ‘mouthy’ is different. In my experience, it’s most definitely applied to both men as well as women. When I was at school, I can remember other boys being described as ‘mouthy gits’. And there’s the phrase, ‘all mouth and trousers’, which is certainly applied to men, who like the sound of their own voices. Similarly, noisy, ignorant men are described as ‘loudmouths’. And so on. I also distinctly remember how this got into an RE lesson at school, when they teacher wanted to stop one of the boys from talking during class. She had just been teaching us about the appointment of Aaron as Moses’ spokesman in the events leading up to the Jewish Exodus from Egypt. The Hebrew term for ‘spokesman’ in the Bible literally means ‘Chief Mouth’. One of the lads was continuing to talk over the teacher, so she shouted out his name, and then said, ‘You Chief Mouth’, to the lad’s embarrassment and the hilarity of the rest of the class. Mike ain’t a misogynist by any means, and neither is ‘mouthy’ a gendered term of abuse. This is another meme I found over at 1000 Natural Shocks. The phrase ‘PBUH’ suggests that it does indeed come from a Muslim site, or at least one sympathetic to Muslims. The acronym stands for ‘Peace and Blessing Be Upon Him’. This is supposed to be said by Muslims whenever they mention the Prophet. There are similar respectful phrases, which Muslims are also expected to use about the other prophets venerated in Islam, like Isa – Jesus, Musa – Moses, Ayub – Job, Ibrahim – Abraham, and so on. 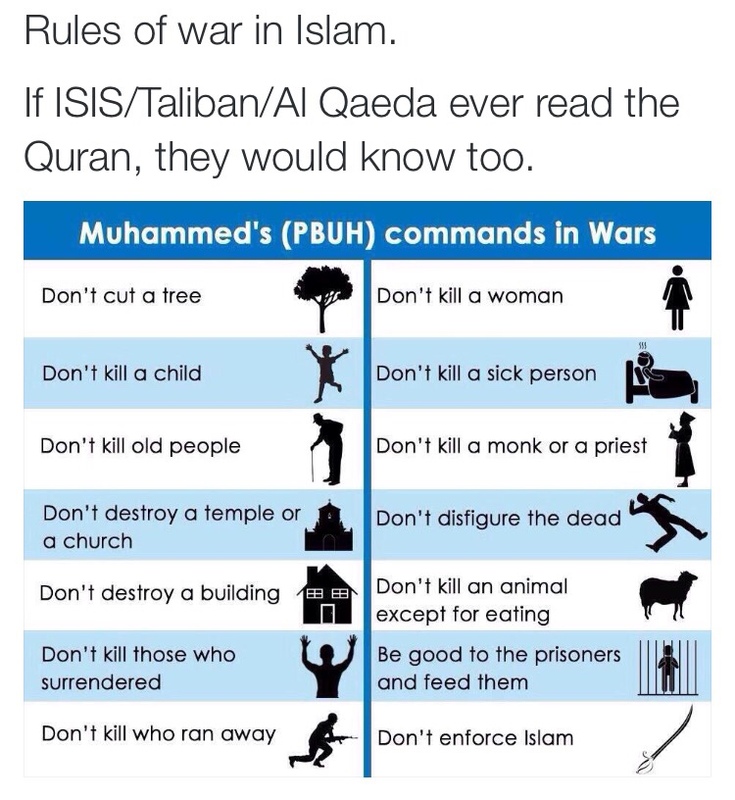 This is pretty much what I was told at College when I studied Islam there – that shariah law prohibited the killing of non-combatants and so on. ISIS, al-Qaeda and the Taliban also know this stuff too. They simply don’t care, and have invented a whole load of convoluted theology to allow them to get away with murdering civilians. There was a programme on Channel 4 a while ago that interviewed a whole load of such Islamists in a seminary in Saudi Arabia. One of them said there that, of course, what they were doing was against Islamic law, but they could never stage their insurrections otherwise. It was the only thing they could do, or words to that effect. Elsewhere on one of the Beeb’s programmes there was a piece explaining that they excuse and justify such atrocities by stating that modern economy and society means that the distinction between ‘civilian’ and ‘military’ no longer exists. Thus they justify killing civilians and non-combatants, quite against the explicit prohibition of Islamic law. Warning: Remember, 1000 Natural Shocks is over 18s only.